On April 23, 1967, Prisoner #416J, an inmate at the notorious Missouri State Penitentiary, escaped in a breadbox. Fashioning himself Eric Galt, this nondescript thief and con man—whose real name was James Earl Ray—drifted through the South, into Mexico, and then Los Angeles, where he was galvanized by George Wallace’s racist presidential campaign. On February 1, 1968, two Memphis garbage men were crushed to death in their hydraulic truck, provoking the exclusively African American workforce to go on strike. Hoping to resuscitate his faltering crusade, King joined the sanitation workers’ cause, but their march down Beale Street, the historic avenue of the blues, turned violent. Humiliated, King fatefully vowed to return to Memphis in April. With relentless storytelling drive, Sides follows Galt and King as they crisscross the country, one stalking the other, until the crushing moment at the Lorraine Motel when the drifter catches up with his prey. 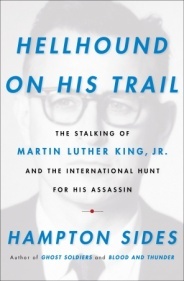 Against the backdrop of the resulting nationwide riots and the pathos of King’s funeral, Sides gives us a riveting cross-cut narrative of the assassin’s flight and the sixty-five-day search that led investigators to Canada, Portugal, and England—a massive manhunt ironically led by Hoover’s FBI. Magnificent in scope, drawing on a wealth of previously unpublished material, this nonfiction thriller illuminates one of the darkest hours in American life—an example of how history is so often a matter of the petty bringing down the great.